For years, yellow gold has taken a back seat to stronger metals like platinum and white gold, especially when it comes to engagement rings. However, it is for this exact reason that yellow gold rings are seeing a resurgence in popularity. Because few people have yellow gold rings, they are now seen as unique. Yellow gold is a fantastic way to stick out from the silvery sea of platinum and white gold. It’s bold, shiny, and beautiful. Another major perk? Yellow gold is great if you’re on a budget. 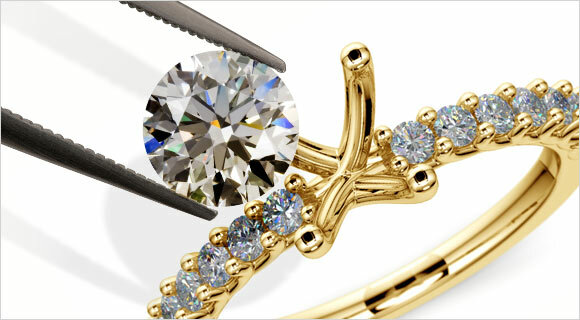 When diamonds are set in yellow gold, it creates an optical illusion. The diamonds look whiter than they actually are. So when a diamond with a more yellowy hue, such as an L or M graded diamond, is set in a yellow gold band, the diamond looks more like a J, or even I, color diamond. That is the magic and wonder of yellow gold! 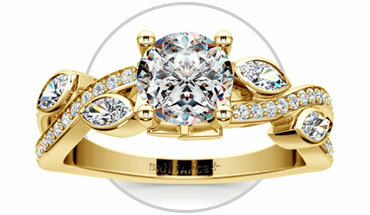 For classic vintage styles, yellow gold gives rings a true sense of timelessness. 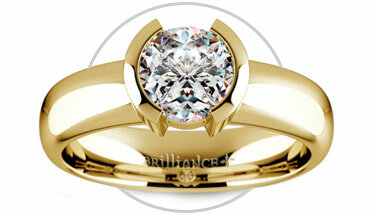 The vibrant hue adds to the feeling that the ring has been around for a long time, and yet has never lost its luster. If you’re interested in a more vintage look, search for bands with floral embellishments, like this Antique Floral Solitaire Engagement Ring or the Twisted Petal Diamond Engagement Ring which uses marquise diamonds to simulate leaves. Antique floral detailing on the inside and outside of the band. 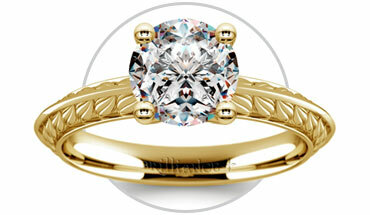 Elegant twisted petal diamond engagement ring setting in 14k or 18k yellow gold. Although yellow gold works with more vintage and antique looks, it also accompanies modern band designs. Simple, clean styles characterized by an atmosphere of strength and indestructibility work well with yellow gold. Split shank bands or thicker bands such as the Solitaire Engagement Ring provide a touch of modernism without getting too wacky or artsy with the design. For a seriously modern look, pay attention to rings that wrap the diamond in a yellow gold halo like this Bezel Solitaire Engagement Ring. 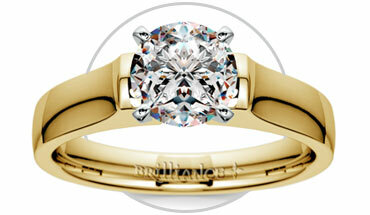 Attractive yellow gold solitaire engagement ring setting showcases your choice of center diamond in a full bezel. Beautiful yellow gold solitaire engagement ring setting features square ends that curve gently upward on either side of your center stone. This alluring yellow gold half bezel solitaire engagement ring setting showcases the distinctive shape and size of your center diamond of choice. Although everything goes well with diamonds, yellow gold goes particularly well because the diamonds are distinguished by the yellow tint of the golden band. The diamonds really pop! 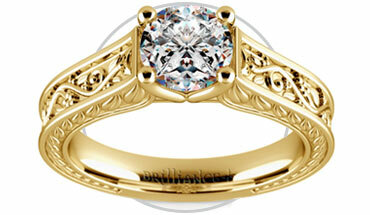 Thus, adding a great deal of tiny melees and accent stones is a popular trend for yellow gold rings. 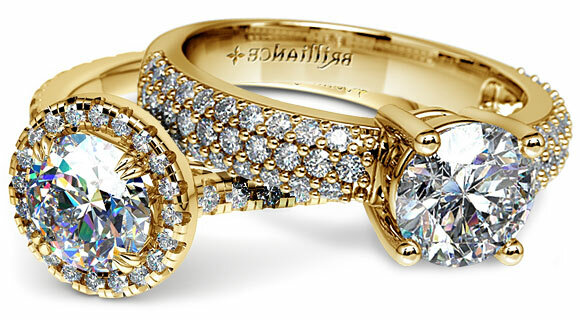 For instance, Brilliance.com Pave Diamond Engagement Ring features a yellow gold band covered in sixty round cut diamonds which accent the glistening center diamond. Though this “blinged-out” style also looks great with a platinum or white gold band, the shiny yellow gold emphasizes all the tiny diamonds in a way that other metals do not. 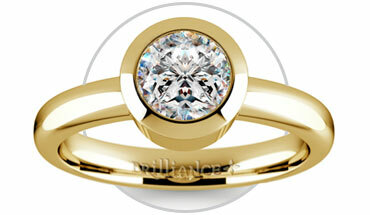 The same effect can also be obtained by having a diamond halo around the center diamond. For a more adventurous look, try adding some colorful accent stones to your ring. 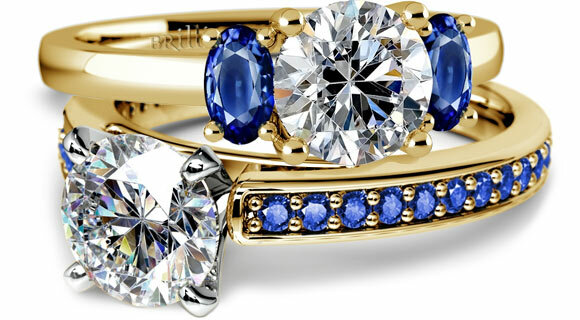 Blue sapphires and emeralds go particularly well with yellow gold and diamonds. For example, this Cathedral Sapphire Gemstone Engagement Ring features many tiny sapphires set into a yellow gold band. The gold and blue hues complement each other and help to make the ring look extremely different from a standard solitaire. Rather than tiny stone accents, another approach for adding a touch of color is to flank the center diamond with two colorful stones as seen in this Oval Sapphire Gemstone Engagement Ring. There are so many rising trends in yellow gold diamond rings that it is easy to get overwhelmed by all the options, however choosing yellow gold will differentiate your ring and make your diamond sparkle even brighter!